This resort features 617 ocean view rooms and 24-hour food and beverage service in 5 specialty restaurants, one main buffet, two snack bars and 6 bars. Guests enjoy a full entertainment program with all-day activities for adults and kids, a hospitality suite and daily transportation to Marina Aquaworld. 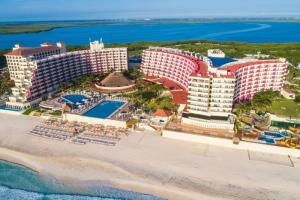 Activities include two water parks and golf at nearby Cancun Golf Club. Complimentary wedding packages are available. Featuring an ideal location overlooking the sparkling Caribbean in the heart of the Cancun Hotel Zone, the Crown Paradise is only 10 minutes from Cancun's largest mall. 15 minutes from the International Airport. Food service is provided 24-hours, and room service is available round the clock. Guests may dine at any of the resort's 6 restaurants and 2 snack bars. There are 6 bars onsite where guests enjoy unlimited consumption of domestic and imported drinks. Aqua world, Iberostar Golf Course, Kukulcan and La Isla Shopping Centers, Water Park Adventure´s Park.